Cast Iron Beer Beverage MERMAID TABLETOP BOTTLE CAP OPENER Unique Nautical Decor. Functional yet decorative party favor tool. Indoor outdoor Luau, beach, pool, tropical island, pirate themed decoration for kitchen, home tiki bar, boat or man cave. Antique Reproduction made of Sturdy Heavy Metal Alloy. Weathered Rustic Brown Finish. Legendary Mermaids exist only in the imaginations of pirates, fishermen and sailors. In reality, our MERMAID BOTTLE OPENER can exist in any kitchen or man cave bar, always ready to open a cold beer or other bottled beverage. Fully functional nautical themed gift made of heavy cast metal, finished in weathered antique rust colored iron patina. What better way to pop open a refreshing beverage, than to have this appealing legendary ocean maiden at your fingertips? Swimmingly useful unique tropical decor tool for any fisherman, tropical Luau, tiki bar, beach, pool or pirate party. A fantastic birthday gift or party favor for sailors and fish loving friends! This functional mythical marine beauty design bottle cap opener can be hung on the wall using a screw or hook (not provided). Her shapely body fits perfectly in your hand. 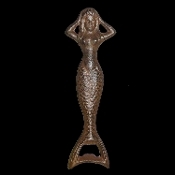 6-inch (15cm) Long Antique Finish Metal Mermaid Tabletop Bottle Opener. *Hand use only, opener does NOT mount for wall use.